Showing results for "casio edifice"
CASIO Edifice EF-305 Original Gasket Case Back O-Ring EF-110 Gasket / O-Ring Material: Rubber This Casio Gasket / O-Ring Also Fits the Following Model Numbers: EF- 305 EF-110 **WATCH BAND MODEL NUMBERS ARE ENGRAVED ON THE CASE BACK WHICH IS FOUND ON THE BACK OF THE WATCH** **International Buyers - Please Note: Import duties, taxes, and charges are not included in the item price or shipping cost. These charges are the buyer's responsibility. Please check with your country's customs office to determine what these additional costs will be prior to bidding or buying. ** Customer satisfaction is our number one goal. Should you have any problems with the item/s purchased please contact us and we will do all that we can to insure you are 100% satisfied with your order. Genuine Casio black resin watch band made for the Edifice EMA-100 model. Includes a set of pins. Note: The picture of the watch is for reference only. Genuine Casio black resin watch band made for the following Edifice models: EFA-131PB EFA-131RBSP Includes a set of heavy duty pins. Note: The picture of the watch is for reference only. eBay Casio Watch Band Ef-500. Edifice All Steel Push Button Deployment Bracelet. 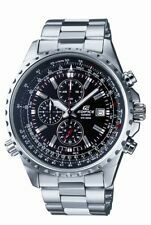 eBay Casio Edifice EFS-101 Quartz Mens Watch- Pre-Owned! 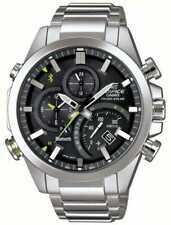 From Casio's impressive Edifice collection, this remarkable men's watch delivers a superb blend of classic design with modern details.Features Date window Retrograde chronograph dial Chronograph: measures 1-second increments up to 10 hours Display Face cover material: mineral crystal Luminescence: hands Case Material: black resin with stainless steel back Diameter: 54 mm Band Material: black resin Clasp: buckle Circumference: adjusts from 140 mm to 228 mm Width: 22 mm Details Movement: quartz Power: battery Water resistance: 100 meters Packaging: gift boxed Warranty: manufacturer's 1-year limited For warranty information please click here Size: X Large. Gender: Male. Age Group: Adult.